Never Fail™ Spring and Shackle Bushings are maintenance free, permanently lubricated, and guaranteed to never fail. Never Fail™ Bushings are significantly less expensive and infinitely more durable than wet bolts with bronze bushings that become worn over time. Made of modified polyamide, Never Fail™ Bushings hold up to the constant beating that road shock and vibrations provide. 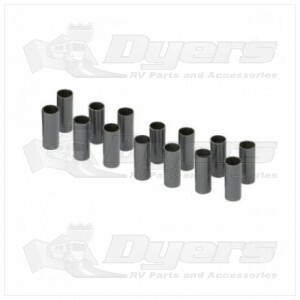 Get Never Fail™ Bushings today and protect your trailer, and your wallet from costly break downs! Replace your old, worn-out bushings with Lippert Components Never Fail™ Bushing kits in convenient single, tandem and triple axle retail packages.